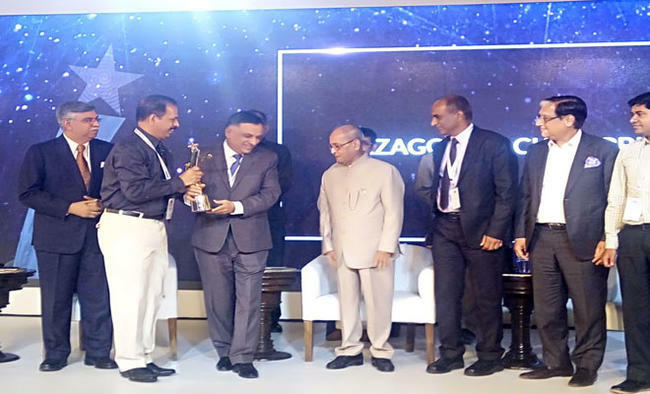 Cmde Rakesh Anand, Chairman and Managing Director, Mazagon Dock Shipbuilders Ltd receiving award from former President of India, Hon’ble Shri Pranab Mukharjee on 19 April 2018 at Hotel Taj Palace, New Delhi. New Delhi: Country’s premier warship building yard, Mazagon Dock Shipbuilders Ltd (MDL) won the 13th BML Munjal Award for ‘Business Excellence through Learning and Development’. Former President of India, Hon’ble Shri Pranab Mukharjee presented the award to Cmde Rakesh Anand, Chairman and Managing Director, MDL on 19 April 2018 in a glittering ceremony at Hotel Taj Palace, New Delhi. Cmde T V Thomas, Director (Corporate Planning & Personnel) along with senior officials from MDL also attended the ceremony.